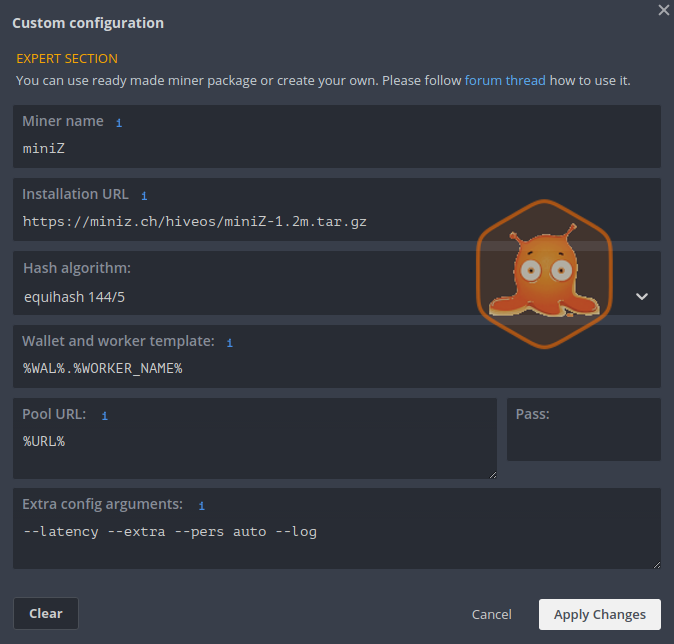 How to use miniZ with Hive OS - miniZ - Check here for help. we made a package for you to use miniZ with Hive OS. To use miniZ with Hive OS, you only have to create a new Flight Sheet: in Miner field select custom, then click in Setup Miner Config and fill the necessary fields as you see in the example figure. Equihash 144,5:--par=144,5(no need, default), your coin personalization string (Ex: --pers BgoldPoW, --pers BitcoinZ). Equihash 96,5: --par=192,7(recommended), your coin personalization string (Ex: --pers Safecoin, --pers auto). Equihash 96,5: --par=96,5(recommended), no need for personalization string (--pers ZcashPoW). You can find additional command line arguments @ Usage and/or FAQ pages. For support, questions and feedback use the comment box below.